Should I bother to note how big a fan I am? Someone took a very good hand-held video [4 min] of the Twilight Zone-based ride, Tower of Terror, at Disney’s Hollywood Park. A long [7 min] video of Serling describing the show to potential advertisers. It is an oddity since he isn’t smoking while he speaks. From the Twilight Zone Movie – a long [8 min] and short [1 min] version of the great introduction to the 1985 movie. I loved the Burgess Meredith connections. There is a fifth dimension, beyond that which is known to man. It is a dimension as vast as space and as timeless as infinity. It is the middle ground between light and shadow, between science and superstition, and it lies between the pit of man’s fears and the summit of his knowledge. This is the dimension of imagination. It is an area which we call … the Twilight Zone. You unlock this door with the key of imagination. Beyond it is another dimension: a dimension of sound, a dimension of sight, a dimension of mind. You’re moving into a land of both shadow and substance, of things and ideas. You’ve just crossed over into … the Twilight Zone. You’re traveling through another dimension; a dimension not only of sight and sound, but of mind. A journey into a wondrous land whose boundaries are that of imagination. That’s a signpost up ahead, your next stop, the Twilight Zone. 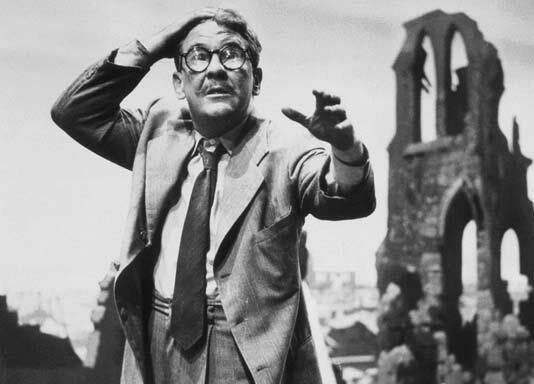 [Introduction] Witness Mr. Henry Bemis [Burgess Meredith], a charter member in the fraternity of dreamers. A bookish little man whose passion is the printed page but who is conspired against by a bank president and a wife and a world full of tongue-cluckers and the unrelenting hands of a clock. But in just a moment Mr. Bemis will enter a world without bank presidents or wives or clocks or anything else. He’ll have a world all to himself–without anyone. [Closing] The best laid plans of mice and men–and Henry Bemis, the small man in the glasses who wanted nothing but time. Henry Bemis, now just a part of a smashed landscape, just a piece of the rubble, just a fragment of what man has deeded to himself. Mr. Henry Bemis … in the Twilight Zone. [Introduction] Suspended in time and space for a moment, your introduction to Miss Janet Tyler, who lives in a very private world of darkness, a universe whose dimensions are the size, thickness, length of a swath of bandages that cover her face. In a moment we’ll go back into this room and also in a moment we’ll look under those bandages, keeping in mind, of course, that we’re not to be surprised by what we see, because this isn’t just a hospital, and patient 307 is not just a woman. This happens to be the Twilight Zone, and Miss Tyler, with you, is about to enter it. [Closing] Now the questions that come to mind. Where is this place and when is it? What kind of world where ugliness is the norm and beauty the deviation from that norm? You want an answer? The answer is, it doesn’t make any difference. Because the old saying happens to be true. Beauty is in the eye of the beholder, in this year or a hundred years hence, on this planet or wherever there is human life, perhaps out amongst the stars. Beauty is in the eye of the beholder. Lesson to be learned … in The Twilight Zone. This entry was posted in Entertainment and tagged Henry Bemis, Rod Serling, Sentences that I have loved, Twilight Zone. Bookmark the permalink.